A species description is a formal description of a newly discovered species, usually in the form of a scientific paper. Its purpose is to give a clear description of a new species of organism and explain how it differs from species which have been described previously, or are related. The species description often contains photographs or other illustrations of the type material and states in which museums it has been deposited. The publication in which the species is described gives the new species a formal scientific name. Today, some 1.9 million species have been described and named, out of some 8.7 million that may actually exist on Earth. Millions more have become extinct. It is customary for scientists to introduce all relevant new findings and research in a scientific manuscript, which is sent to other scientists for peer review. If accepted, it is published in a scientific journal of the appropriate discipline or in a book. Descriptions and naming of a new species or other taxa follow the same process. ↑ "International Code of Zoological Nomenclature, Recommendation 25C". Retrieved June 18, 2011. ↑ One example of an abstract of an article naming a new species can be found at "Methylobacterium cerastii sp. nov., a novel species isolated from the leaf surface of Cerastium holosteoides". Retrieved June 18, 2011. 1 2 "A beetle called Hitler". Rose George. 13 April 2002. ↑ Capinera, John L., ed. (2008). Encyclopedia of Entomology (2nd ed.). Dordrecht: Springer. p. 2765. ISBN 1402062427. ↑ Strahan, Ronald; Conder, Pamela, eds. (2007). Dictionary of Australian and New Guinean Mammals. Collingwood, Victoria: Csiro Publishing. p. 15. ↑ "Curiosities of Biological Nomenclature". Retrieved June 18, 2011. ↑ "Financing conservation efforts by selling naming rights of new species". Retrieved June 18, 2011. ↑ Konungs skuggsjá (in Norwegian). ↑ Linnaeus, C. (1735). 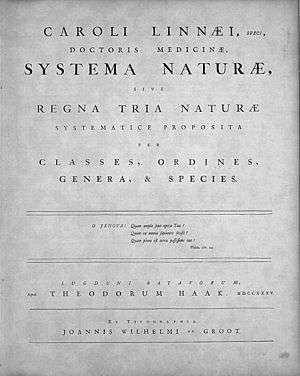 Systema Naturae. ↑ Quentin Wheeler; Sara Pennak (January 18, 2012). Retro SOS 2000-2009: A Decade of Species Discovery in Review (Report). International Institute for Species Exploration, Arizona State University. Retrieved April 25, 2013.